Observe a process in a structured way, distill some practical ideas and then implement these ideas with grace and speed. If this is what you want to do in your business then this article explores how StreamLiner can help you. StreamLiner includes numerous tools and an even wider range of options as to the way you can use the tools. The included user guide offers some ideas on linking the various tools together, but in this article I am going to focus on the areas of spaghetti mapping, improvement meetings and linking to key documents. 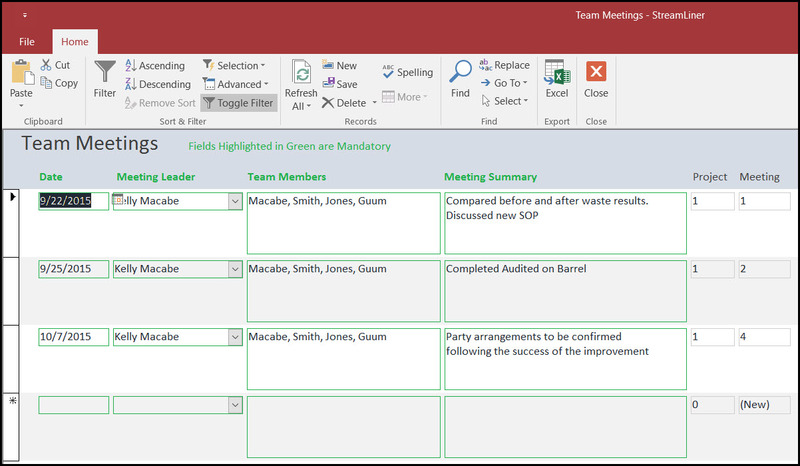 You can download a meeting responsibility chart at the bottom of this article. A spaghetti map visually captures the physical flow of information, or products, around your business. A common objective for businesses is to reduce the distance traveled around a business. A business usually picks up this hidden cost. By reducing it you can achieve a natural reduction in the time it takes to complete a business process thus increasing in the business' capacity. StreamLiner provides a very simple format for capturing your spaghetti map. Print out the template for the your project, draw a sketch of the working area and then use a line to represent where the product (or information) moves to. In most cases, just by reviewing the movements, it staggers people as to just how far things travel. I once watched a piece of paper in an office travel over 400 meters just to get processed by three people (it went back and forwards a lot!). The insights gained from watching a process in this manner can then be logged within StreamLiner as improvement actions. StreamLiner uses a inbuilt priority system that we call BCS. This acronym stands for Benefit, Cost and Speed. The software encourages you to quickly evaluate each improvement idea on this basis and then uses this to provide you with a prioritized improvement actions list. We include the scoring instructions within both the user guide and the software itself. This scoring works for all of the actions that you generated within StreamLiner (whether they come from a 5S audit, a waste walk or a process analysis exercise). This means that you can determine what course of action gives you the biggest return on your efforts. Now, of course, change doesn't just happen by magic! We built in a meetings and document log function into the software. Having meetings to discuss improvement actions and to monitor progress is invaluable. Performing these meetings effectively, however, can speed up your overall progress and improve clarity across the business. 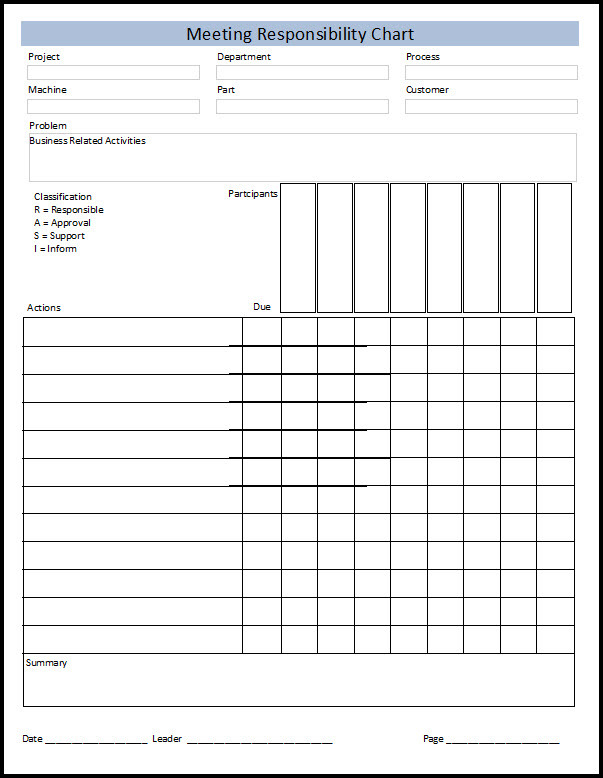 We included a meetings record template inside the software. Use this during your meetings to capture any actions and who is responsible for carrying them out. Then add these actions to your current actions list and managed via the BCS scoring system. Later, print a meeting summary to document the meeting. Alongside the meetings, and the improvement actions, may be the need to link to key documents. Many users of StreamLiner use the software during meetings and having access to key documents quickly makes a big difference when making decisions. The documents function of StreamLiner allows you to keep a list of links to your documents (as opposed to storing the documents) for just this purpose. Imagine you are in a meeting and you want to review a memo linked to the project. Go into the documents screen, click on the link and it comes up on the screen. No more trawling around the server getting lost and wasting time. With all the references linked within a project, you can print a summary of these references. This helps you document your continuous project. You can take any action and trace it back to the source. Within the action list, just double click source number. 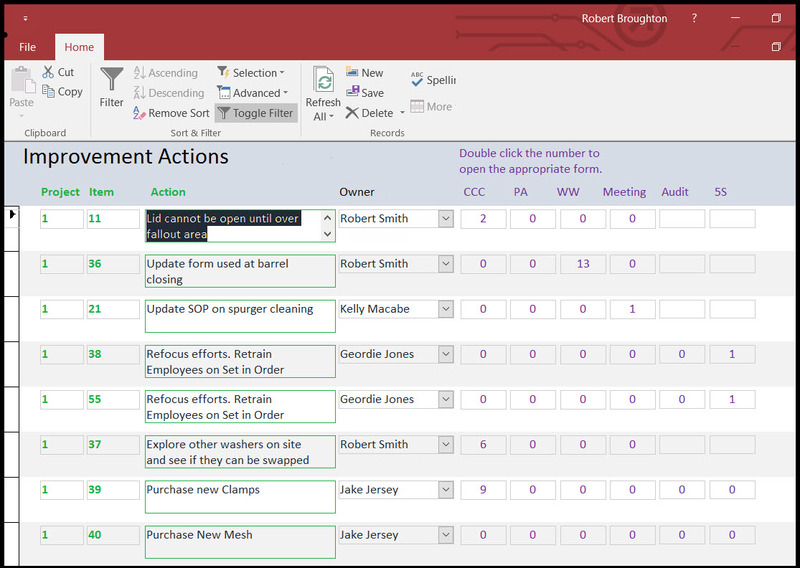 For example if the action came from a meeting, double click the meeting number in the action list and the details for that action in relationship to the meeting appears. The actions reporting functions, combined with the meetings template creates a virtuous circle for aiding the process of change within your business. StreamLiner lets you have an unlimited number of projects. Each project can have an unlimited number of actions. To get a birds eye view, with StreamLiner you can see all the actions from all the projects in a combine view. This prevents you from forgetting about actions and lets you organize them. To recap; StreamLiner offers a structured way to make observations about your processes, allows you to capture and evaluate improvement opportunities and to manage the implementation through the virtuous circle of effective meetings and efficient actions management. As I said before, effective change isn't magic, but it might look like it when done using StreamLiner!